On the Fourth of July, I like to take a moment to celebrate the most American of all sports. Specifically, I would like to take a moment to pay tribute to a man whose World Record cannot be recognized due to a technicality. The sport in question is, of course, Competitive Eating. And the athlete is Takeru “Kobi” Kobayashi, a.k.a. The Tsunami. Ranked among the world’s top speed-eaters, Kobayashi can stuff food down his throat so fast, and in such vast quantities, you’d think he was on a Carnival cruise (if you’ve never been on one, they’re basically a floating Golden Corral, but that’s a subject for another day). From 2001 to 2006, the 150-pound Kobayashi was the undefeated champion of the annual Nathan’s Hot Dog Eating Contest, which takes place in Coney Island every year on the Fourth of July. If you’re not familiar, this event is essentially the Super Bowl of Gluttony. 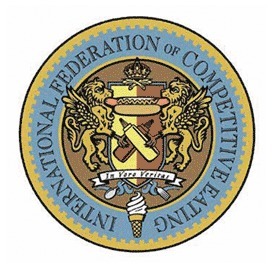 This contest is organized and governed by the International Federation of Competitive Eating (IFOCE), an organization I sincerely wish I were making up. For the past six years, I’ve been following this contest with more enthusiasm than I can justify to myself or anyone else. I’m not exactly a fan of this so-called sport, which is disgusting on just about every level. Still, I can't look away. Over the years, I’ve grown far too familiar with its ahem, “athletes,” who are also known as “gurgitators” (no, seriously). I have to admit that this is in no small part because of The Tsunami. Takeru Kobayashi did for over-eating hot dogs what Michael Jordan did for basketball; what Picasso did for 20th Century art; what Vanna White did for game show hostesses. He transcended his medium. The sport—nay, the world—would never be the same. 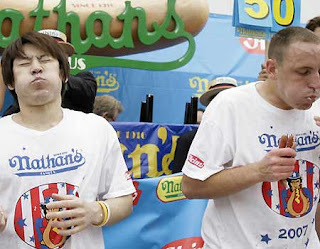 In 2001, Takeru—then a 23-year-old upstart—astounded the audience and judges when he downed 50 dogs at that year's Nathan's Hot Dog Eating contest. At the time, they didn’t even have printed signage for such a number, forcing the judges to scribble out the scorecards by hand. Until that point, the record for consumption was 25.5 dogs, set in 2000 by Kazutoyo Arai, also of Japan. The previous record was 24.5, achieved by Hirofumi Nakajima, yet another native of the Land of the Regurgitating Rising Sun. To give you some perspective, between 1916 and 1990, the official record was a measly 16 hot dogs in ten minutes. Most years, the winners downed an average of 11 or so wieners and buns. In 2007, the playing field changed yet again when Joey “Jaws” Chestnut, a gurgitator from San Jose, California, took back the title. In that year’s Coney Island contest, he scarfed 68 wieners and buns compared to Takeru’s 63. America, at last, had a Champion. Earlier today, Chestnut once again won the Mustard Belt at the official Nathan’s Hot Dog Eating Contest in Coney Island, eating 62 hot dogs in just ten minutes. Although the winner by a landslide, Chestnut, whom the IFOCE non-ironically describes as “an American hero and a national treasure,” didn’t even meet his own official record of 68 dogs. Meanwhile, at a posh Fifth Avenue rooftop bar in Manhattan, the great Kobi unofficially broke Joey Chestnut’s official world record by eating an astounding 69 wieners and buns (wasn’t that a Magnetic Fields album??). However, Takeru’s name is unlikely to appear on the official record. He’s currently involved in a contractual dispute with the aforementioned International Federation of Competitive Eating (kind of like the NFL of over-eating), which has the last word in food-gorging records. Even though Kobi’s victory is unofficial, he brought honor to his country. Granted, a very disgusting sort of honor. One that kind of makes you want to barf just hearing about it. But he went the distance. Why is it that everything Americans start has to be perfected by the Japanese? They already have the most efficient cars, electronics, and giant, city-destroying lizards. Why can’t they even leave us our dignity in a sport that, clearly, has none to begin with?